Hamid Mir is a famous top Columnist and an Anchor Person of a popular Geo TV network programme “Capital Talk”. Hamid Mir was born in (date of birth July 23, 1966). He is also known for his columns in top Urdu and English Newspapers. Mir was born and educated in Lahore Pakistan. He attended University Laboratory School New Campus and Government Central Model School, where he completed his Matric examination. He earned his intermediate degree from Government Science College and his B.A. degree from Government College. He earned his master’s degree in mass communications from the University of Punjab in 1989. Hamid Mir belongs to a literary and journalistic family. His Grandfather Mir Abdul Aziz was a famous poet in Urdu, Persian, and Punjabi in Sialkot who actively participated in the movement for the creation of Pakistan under the leadership of Muhammad Ali Jinnah. Hamid Mir’s Father, the Late Professor Waris Mir, was a columnist for Daily Jang. Two Brothers of Hamid Mir are also journalists. Amir Mir works for The News International and Imran Mir works for Pakistan Television. A third brother, Faisal Mir, is an industrialist. Hamid Mir’s Wife worked with Pakistan television and for a private television channel for many years. Hamid Mir has Two Children, Arafat Mir and Ayesha Mir. 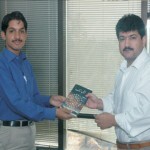 Hamid Mir joined the Daily Jang in 1987 and worked there as sub-editor, reporter, feature writer and edition in charge. In 1994, he broke the submarines purchase scandal in Daily Jang. Mir lost his job the day his article was published. In 1996, Mir became the editor of the Daily Pakistan in Islamabad, making him the youngest editor of any national Urdu newspaper in the history of Pakistani journalism. He lost his job again in 1997, when he wrote an article in the Daily Pakistan about the corruption of the that Government. Also in 1997, he joined Daily Ausaf (Islamabad) as founding editor. In 2002, Hamid Mir joined GEO TV as the Northern Region editor. Since November, 2002, he has Hosted GEO TV’s Capital Talk, a political talk show in which top Pakistani politicians from the government and opposition have appeared. Famous Indian Newspaper “The Hindu” wrote about Pakistani journalist Hamid Mir “He has interviewed just about all the political bigwigs of the modern world. In Pakistan, the list includes President Pervez Musharraf, Prime Minister Shaukat Aziz, Former Prime Ministers Benazir Bhutto and Nawaz Sharif. As for the movers and shakers of the wider world, there is the savvy U.S. Secretary of State Condoleeza Rice, besides the controversial Colin Powell, Richard Armitage and others. He has also interviewed President Hamid Karzai of Afghanistan. A well known American Newspaper “Christian Science Monitor” declared Hamid Mir as the hero of Pakistani Media. Hamid Mir became a voice of peace and objective journalism during the India-Pakistan tension created after the Mumbai attacks in November 2008. Der Spiegel declared him the Most Popular Journalist in Pakistan. Mir has participated in many international seminars and conferences on terrorism. He appears regularly on CNN, BBC and many Indian channels as a security analyst. This is the first time I have written and sent to you my observations for the innocent people of ORANGI AND BANARAS, on 28th August 2010 to CapitalTALK email address, and I watched your programme you visited KATI PAHARI, so I can EASILY pointed you that it is incomplete visit or your agenda is another not as per my letter sent to you. Please see my above mail. May ALMIGHTY ALLAH protect you. I can write more and more in this regard because I am only Musalman and Pakistani, residing in Orangi and not have any concern with any political and religious wing. Thanking you and awaiting your response.